I enjoy risotto – in theory. In practice, I dislike the close attention it requires in its making at home, and at restaurants, I often find the portions and savory flavors overwhelmingly rich. 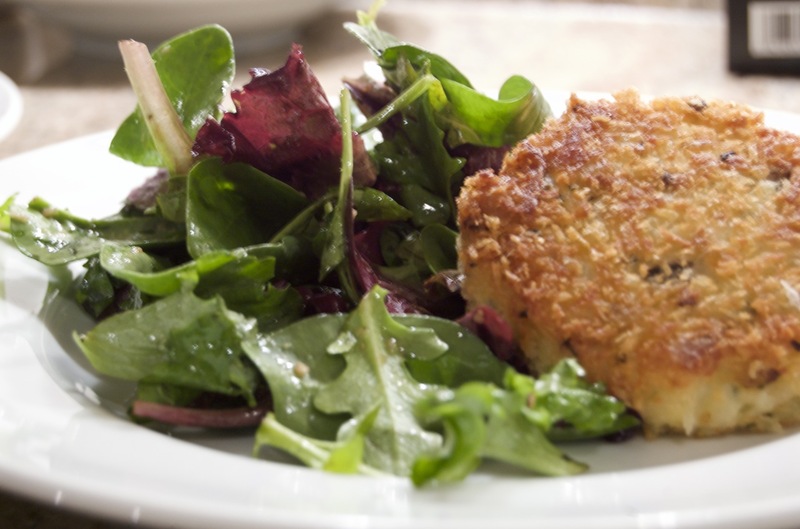 So, when I happened upon a recipe for Chive Risotto Cakes in Ina Garten’s latest cookbook, I initially dismissed it as a recipe that would require a lot of work that would result in my frying up an already-fat-laden dish. But it was Ina … I should have known better! The Barefoot Contessa recipe calls for boiling up Arborio rice, and then mixing it with some Greek-style yogurt, shredded fontina (which melts nicely), a few eggs and chives. Chilled and formed into patties before being dredged in panko and sauteed in olive oil, it’s remarkably straightforward and tasty. Served with a green salad, it’s a great lunch or light supper. 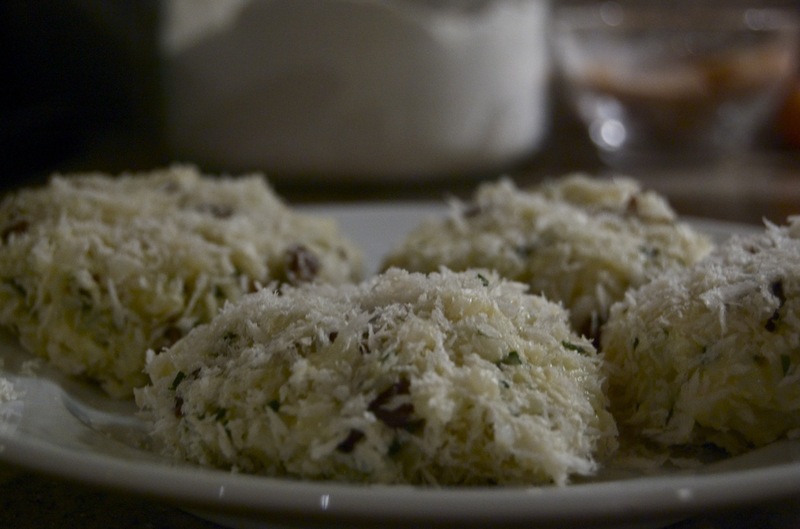 In fact, I enjoyed the risotto cakes so much, I kept making them just as she had written – until, one day, Husband gently said, “This is good, but it is kind of boring.” I opened the refrigerator to see what I could do about that, and spied an extra package of mushrooms. I sauteed those up with some thyme while the rice was cooking, and this version of the dish was born. Bring a large pot of water to a boil and add ½ tablespoon salt and the Arborio rice. Cook, stirring occasionally, for 20 minutes. The grains of rice will be quite soft. Drain the rice in a sieve and run under cold water until cool. Drain well. While the rice is cooking, heat 1 tablespoon of olive oil in a 10- or 12-inch saute pan. When the oil is shimmering, add the mushrooms and cook over high heat without stirring for 30 seconds; season with salt, pepper and thyme and continue to cook, stirring occasionally, until mushrooms are lightly browned, about 4 minutes longer. Set aside. Meanwhile, whisk together the yogurt, eggs, chives, Fontina, 1 ¼ teaspoons salt, and the pepper in a medium bowl. 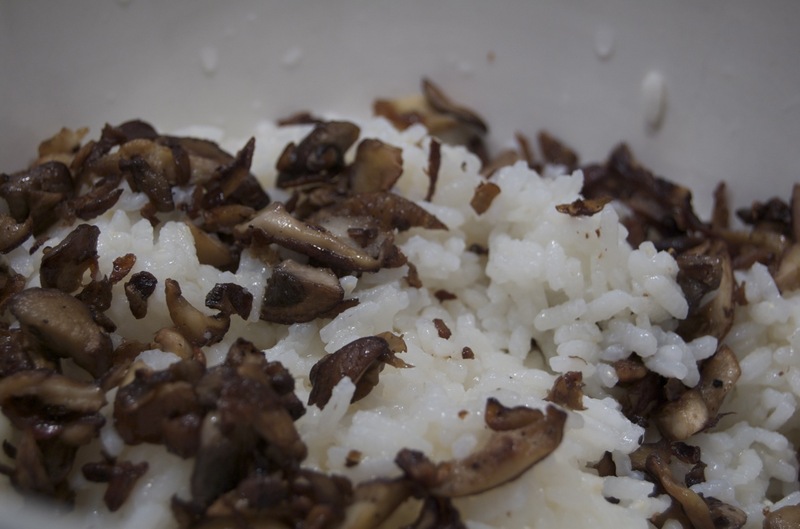 Add the cooled rice and mushrooms, and mix well. Cover with plastic wrap and refrigerate for 2 hours or overnight, until firm. Spread the panko in a shallow dish. Heat 3 tablespoons olive oil in a large skillet over medium-low heat. Using between 1/4 and 1/2 cup of rice mixture, form patties about 3 inches in diameter and ¾ inch thick. Dredge the patties in the panko, turning once to coat. Working in batches that allow the patties plenty of space in the skillet, place the patties in the hot oil and cook, turning once, for about 3 minutes on each side until the risotto cakes are crisp and nicely browned. Place on a sheet pan lined with parchment paper and keep warm in the oven for up to 30 minutes. Continue cooking in batches, adding oil as necessary, until all the cakes are fried.